Ricoh has announced their second Instagram contest for the Ricoh Theta. 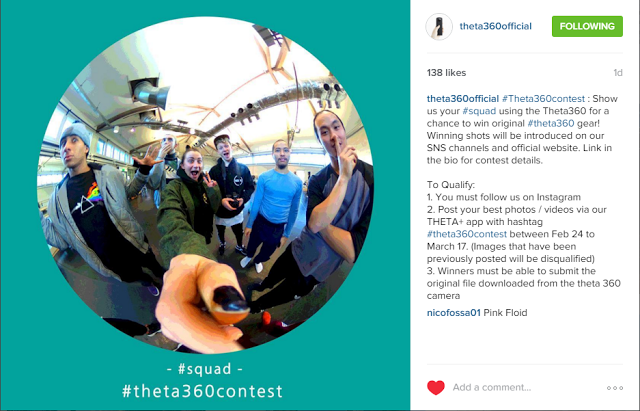 The theme for this contest is “Show us your #squad” — use the Theta to take pictures with your friends! The contest period will be from February 24 to March 17. The contest rules don’t expressly say that the photo itself has to be taken within that time period, but they do say you’re not allowed to use pictures that you’ve previously posted. 1. You need to follow the official Ricoh Theta Instagram account (@theta360official). 2. Photos must be taken with the Theta (original, m15 or S), and must be edited on the Theta or Theta+ app. You can submit as many entries as you want. If you’re selected as a winner, they will ask you for the original equirectangular image, and the edited cropped entry. There will be 1 winner and 9 runner-ups each for photos and for videos. The winners will receive an original Theta soft case, or a Theta strap attachment set. Each runner-up will receive a Theta tote bag and original stickers. Winning images will also be featured on the Ricoh Theta website, SNS and at RICOH Imaging Square. Note: the first Theta Instagram contest had over 1,000 entries. The official website for the contest is here.